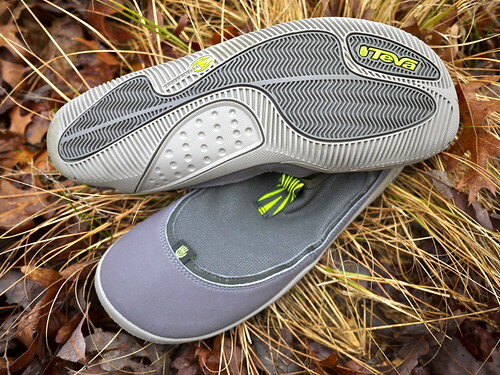 Technically speaking, the Teva Nilch is a men's water shoe, but in my experience the shoe is a not at all well suited to this function. Why? Well, I have used the Nilch several times now as my backpacking ‘water’ shoes to cross small creeks and rivers during hikes, but on every occasion the shoes were totally unable to drain, leaving me with shoes full of slushing water – fail! 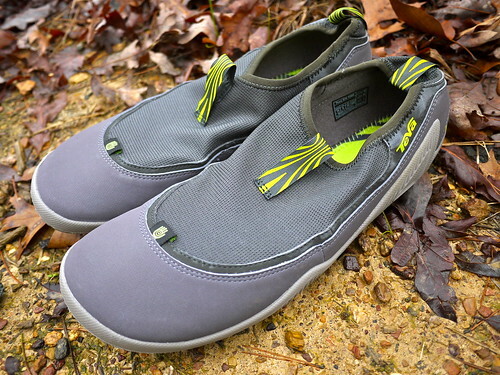 It’s a shame because for the most part I’m a big fan of Teva, but something went terribly wrong with the design or classification of these as a water shoe. 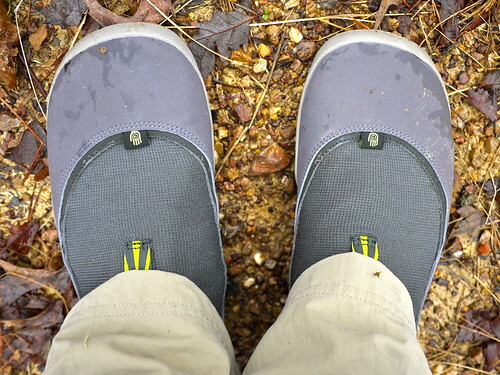 Due to the surprisingly good (but annoying) water holding tendencies of the Nilch combined with the increasingly colder weather toward the end of the year, I've been wearing the Nilch as my primary camp shoes during many of my backpacking trips – and in this particular capacity they excel! (Listen up Teva, you should re-classify these as a camp shoe). This is where the Nilch shines in my opinion. I have very flat feet which means I tend to need wide fitting shoes to avoid them flexing open at the midsole as I walk. The Nilch is both a wide fitting and flexible enough shoe to avoid this from happening, making them snug and comfortable but also flexible enough for people like myself with wide feet. The toebox on the Nilch is also very spacious with plenty of room for my toes to spread out. You may think that the combination of wide fit and large anatomically shaped toebox would make for a loose or sloppy fitting shoe, but the elasticized upper takes care of this, keeping the shoe snug and in place without suffocating or squeezing your feet. These are very comfortable shoes. The Nilch is also true to size. After wearing the Nilch for quite some time I was slightly surprised when I performed the classic ‘flexibility’ test to see that these are not the most flexible shoes that I have tried. Compared to many they would rank as ‘fairly’ flexible. As you can see in the photographs, the Nilch are most flexible at the midsole, bending with ease, but the toe and heel sections are surprisingly firm – not at all how they feel on my feet. I’d like to take a moment to mention the amazing amount of grip the Nilch provide. 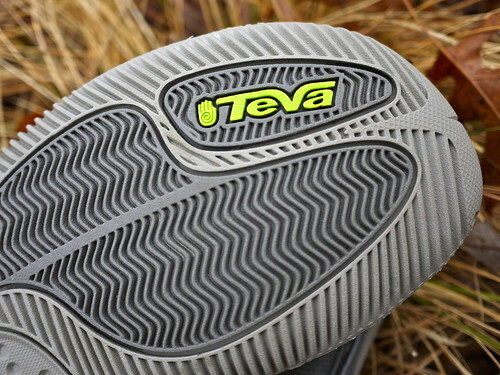 The outsole is made of Teva’s patented Spider Rubber. I don’t know exactly what that is, but according to Teva it is a versatile rubber compound that successfully blends high friction with good durability to make a non-marking rubber that performs exceptionally well on both wet and dry terrain. 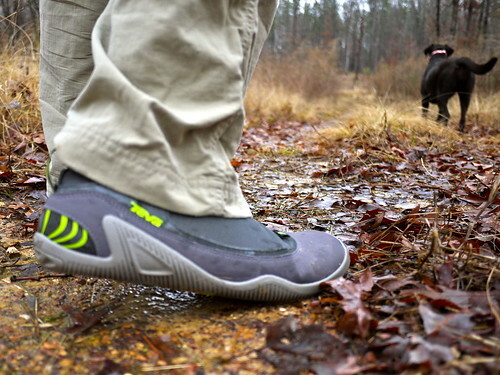 The rubber grip feels as though it actually gets more 'sticky' or grippier in wet conditions and is perfect for walking around on the rocks alongside a stream or creek. After proving to be a complete failure as a water shoe, the Nilch performed spectacularly as a lightweight shoe for walking in and around camp. I’ve taken the Nilch along on several hikes now (remember they only weight 5 oz) and look forward to slipping them onto my feet as part of my camp setup ritual. 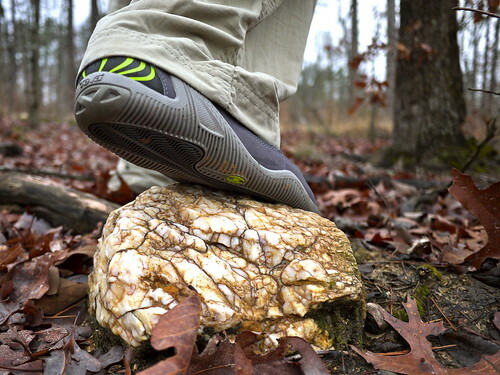 I've also been keeping these on my feet and wearing them for short hikes across rocky and wooden terrain. The 6mm sole is almost perfect for providing protection to the bottom of my foot while allowing my feet to feel the terrain underneath them. They give a sense of connection with the ground. The Nilch were so comfortable to wear as a camp shoe that I decided to clean them off in some soapy water and try wearing them around the house. I work from home and although I use a computer a lot, I'm constantly moving around and multitasking. I tend to slip on the Nilch at the start of my day as a casual slipper, thrn leave them on throughout my work day. I wear them out and about too, running my kids to classes, on shopping errands, and to my karate classes - they are so easy to slip on and off I've even worn them out in the evening as a casual dress shoe with a pair of jeans, getting several compliments. For some reason I don't find these particularly comfortable as a walking shoe. I've tried wearing them a few times on walks along the sidewalks and have ended up with my feet aching. That doesn't happen when I wear them across uneven and rough terrain. This may be more of an issue with me adapting to this style of shoe than a fault of the shoe itself. I wore the Nilch for one run of approximately 3 miles, but swore to never do it again. They were a little too loose on my feet (without socks) when running, a sensation I could not get used to and one that was causing me to over compensate with my toes. I also run with a mid-foot strike and the Nilch were too soft to support my foot as it struck the ground. I personally would not recommend these as a minimalist running shoe. The Teva 'spider' rubber soles of the Nilch feel as though they would wear very quickly on a rough surface, but that was not the case. I've logged well over 50 miles on these now and the rubber sole and grip pattern appear to be almost untouched. I think that these would wear more quickly on a blacktop or paved surface than the wooded or muddy terrain of my usual hikes, but I am very impressed with how well the Nilch are lasting. I've also washed the Nilch several times by throwing them in our washer on a standard wash cycle and both the outer sole and the upper are showing no signs of fading or loose threads in the stitching - remarkably durable. As a 'water' shoe the Nilch are a complete an utter failure. 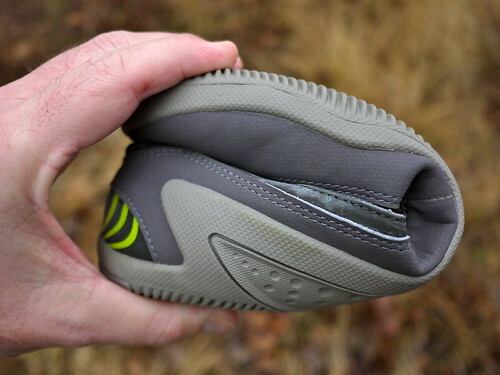 If you submerge your foot beyond the elastic acted upper to point that they fill with water, they will drive you crazy by holding in all of the water instead of draining. As a shoe for wet and slippery surfaces these are amazing - you may feel like Spiderman with that 'spider' grip :) The Nilch are also perfect as a lightweight and easily pack able camp shoe (take note Teva) and perform well in rough and muddy conditions. They are too soft and loose to be an effective minimal running shoe. At under $50 these are an amazing buy for all the great uses mentioned above. Just don't buy them as a water shoe!